Go Metro and get 10% off your purchase! 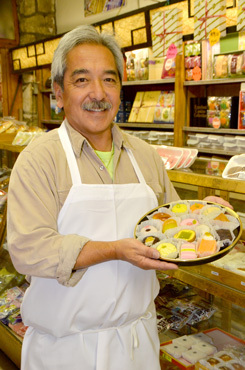 Fugetsu-Do has been a family owned and operated confectionery store in Little Tokyo since 1903. Japanese rice cakes, more commonly known as mochi (rice cake), and manju (sweet bean-filled rice cake), are the staples in this lovely space. The shop, currently opeated by Brian Kito (the grandson of the original owner) sits East First Street, the heart of historic Little Tokyo. Fugetsu-do is the finest Japanese manju artisan in Los Angeles. 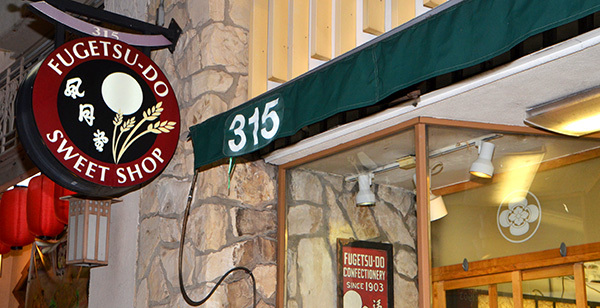 Check out Fugetsu-Do on Yelp and search on Google to see the countless positive reviews of its products. The over 100 positive reviews and the 100 years of being in business can't be wrong! We invite you to come by the store or to order our mochi and have it delivered fresh to your doorstep! Show your valid TAP card. Fugetsu-Do is located at 315 E. 1st Street, only a block from the 1st/Alameda (Little Tokyo/Arts District) Station. For your best route, use the Trip Planner. Open a panel to view items within that category. Starbucks - Wilshire Blvd. and Curson Ave.
Starbucks - Wilshire Blvd. and Detroit St.
Starbucks - Wilshire Blvd. and La Cienega Blvd. Subway Restaurant - Wilshire Blvd. and Detroit St. Subway Restaurant - Wilshire Blvd. and Highland Ave. Subway Restaurant - Wilshire Blvd. and La Cienega Blvd. Master Aesthetician Jacqueline Lozano L.E. Blue Gold for Life Inc.
Hi- Mo ~ Hi Hair Inc.
Perpetual Capital Resource Group, Inc.